Imexsar supplies milled and atomised dense medium ferrosilicon (DMS FeSi) to the mining and metal recycling industries. Products are produced in 3t batches ensuring Imexsar is able to maintain stringent quality controls and comply with technical specifications. DMS, generically referred to as heavy medium separation (HMS), is a process commonly used to separate a range of minerals or scrap metals from one another, using the different density properties of each component. A seemingly dense medium is created by mixing DMS FeSi 14% – 16% powder with water to produce a quasi-slurry of required density, prompting the different mineral particles or metals to either sink or float, according to their respective densities. Therefore, DMS FeSi is a key component in the separating process and directly contributes to the efficiency of the separation achievable. Importantly, the quality of the powder not only affects the separation efficiency, but also influences its ability to be recovered. Separation units can be either static (bath separators such as drums) or dynamic (cyclones). Typically, dynamic separators are used for treating materials smaller than 25mm, while static separators are used for treating materials larger than 25mm. Two main product groups of DMS FeSi exist, which are defined in terms of the manufacturing process: atomised and milled. They have similar chemical compositions and the physical properties are determined through either high-pressure water atomisation, or granulation followed by milling. The selection of grade and size is determined by the density of separation required, the size of the ore treated, whether a static (drum) or dynamic (cyclone) separating vessel is used, as well as the size of the separating vessel, the sharpness of the separation required, and finally cost of the DMS FeSi powder. Atomised ferrosilicon is typically used in DMS applications where the separating density is above 3.0 specific gravity (sg) for static baths and 3.2sg for cyclones. The particle shape of atomised FeSi is more spherical than with milled FeSi. Five different grades of atomised ferrosilicon can be produced, which differs only in the size distribution, namely coarse, fine, extra-fine, cyclone 60, and cyclone 40. Main feature of the atomised grades is the ability to produce high medium densities combined with low viscosities, particularly at densities greater than 3.0sg. Milled ferrosilicon is typically used for applications where the specific gravity rate is below 3.2. It also differs in particle shape, as milled FeSi is more angular than when atomised. A wide range of size grades are manufactured according to size distribution, including 65D, 100D, 150D, 270D and 270F. The medium for the process is the FeSi powder mixed with water, until it achieves the desired density. Its characteristics are typified by density, viscosity and stability. Medium density can be increased by using additional FeSi powder, and reduced by adding water. Medium viscosity is defined as the material’s resistance to flow, which is determined by the concentration, shape and size distribution of the FeSi particles. Contaminants such as slimes or ore fines will further increase the viscosity. Stability is defined as the FeSi particles’ propensity to settle out of suspension. Efficiency of any separation process is determined by the rheology of the medium. Once the appropriate operating density is known, the viscosity and stability inherent to the grade will determine the most suitable ferrosilicon grade. The ideal medium should exhibit low viscosity and high stability; however, in practice, the selection requires a compromise between the two. For optimal plant performance, it is important that DMS FeSi powder exhibits properties that will extend in-use life of the FeSi. These properties are controlled to maximise corrosion resistance, while minimising in-circuit degradation. Corrosion leads to a loss of ferrosilicon, increased viscosity, reduced medium density, medium degradation and more difficult start-ups after plant shutdowns. Dense medium separation has been used for many years as a preferred separation technology, achieved through exploiting the density properties of the materials being treated. The correct grade of dense medium ferrosilicon is important in achieving the desired operational efficiency of the DMS plant, while consistent quality and reliability ensures optimal DMS plant performance. 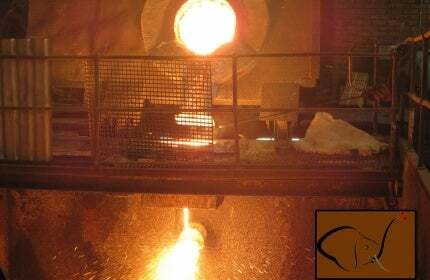 Imexsar’s management team has more than 15 years’ experience in dense medium separation, and is well-positioned in the supply of dense medium ferrosilicon. The Imexsar team has more than 14 year's experience in the marketing, distribution and technical support of dense medium ferrosilicon.